Now you and your friends can pass electronic messages. Throw away the paper and have lots of fun as you send messages the high tech way. FriendChips has two main units and four friend chips that can be used again and again to pass those top secret messages with your friends. 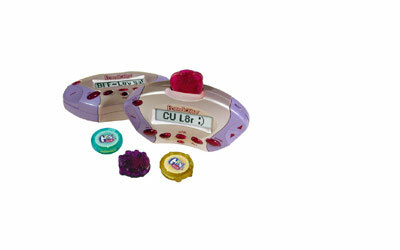 Just insert a chip to the main unit, write your message, record it to the chip and pass it to your friend. Contains two units and a selection of chips and stickers. Insert the chip and key in your message. Send the chips to your friends with your personalized message. Each chip can hold 22 indexes. Includes sounds, clues, sleep mode, and adjustable scrolling speed.